Visitor Maps and Who’s Online by Mike Challis is a favorite among WordPress webmasters to display visitors IP addresses and location. Unfortunately IPV6 addresses are cut off by visitor maps 20 character IPV4 field limit. Doc shows how to mod it’s character length in this tutorial solving the problem. How to mod visitor maps WordPress plugin to accommodate IPV6 character length. Visitor Maps and Who’s Online is unfortunately no longer available on the WordPress plugin repository. Mike Challis explains what happened below. From Mike Challis: I am the original author of Visitor maps. This plugin had a new owner in June 2017 with a WP user profile name “fastsecure”. He attempted to put code in several of his newly acquired WordPress plugins that would connect to a 3rd party server he also owned and place spam ads for payday loans and such in the WP posts. The new owner did not release any new versions of this plugin. The new owner never added spam code to this plugin like he did to other plugins he acquired. The last version I released was 1.5.8.13 with safe code. If you are looking to download visitor maps here is the version I’m using Visitor Maps 1.5.8.12 With GEOIP Plugin. Upload to your WordPress plugin directory and un-compress the archive with a file manager. Activate both plugins. As of this post fidosysop.org is running WordPress 4.5.9 under PHP 7.2. Visitor maps is working fine. 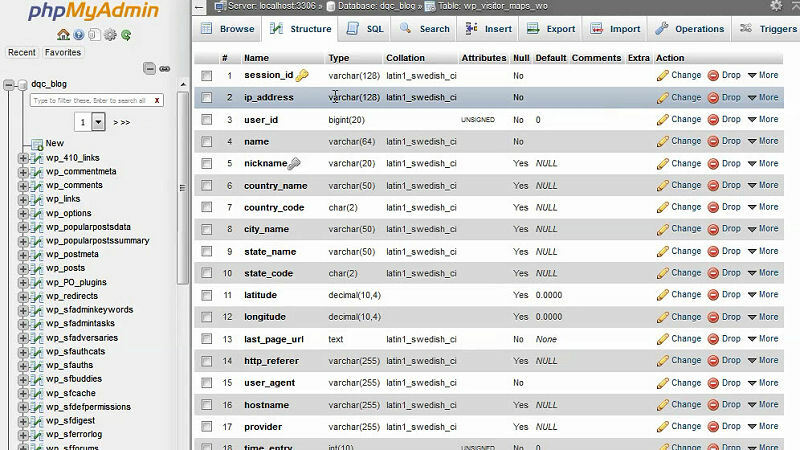 Now lets dig into modifying it’s MySQL database to increase it’s IP field to 128 characters. Since it’s early days with IPV4 the initial character length was 20. But IPV6 addresses are cut off in the display and incomplete. This mod requires making a change to wp_visitor_maps_wo table. Browse to this table and click structure. On element 2 change the IP field from 20 to 128 characters. Save the changes. Update 06/09/18: Dug into VM’s install routine and changed the IP character length. 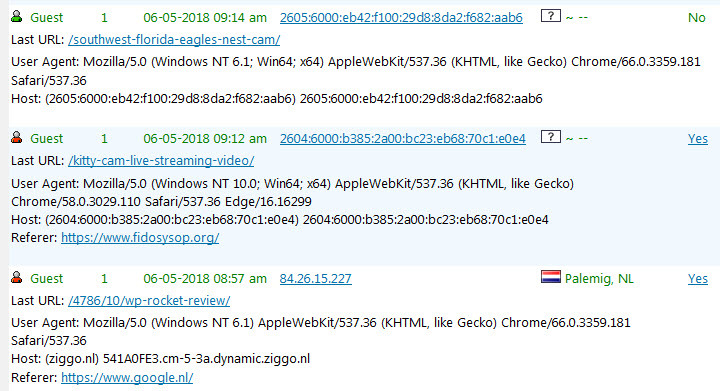 Changed the IP lookup url to https://dnslytics.com/ip/. The detailed visitor info this plugin gives is fantastic! Detailed wordpress visitor maps and who’s online info for both IPV4 and IPV6.